Added by Bill Bowman on June 17, 2014. MacAfee Road School principal Bill Grippo waves to students from the building’s roof as they arrive to school on June 18. UPDATE: MacAfee Road School principal Bill Grippo said he felt fine after spending the night of June 17 on the school’s roof. Grippo said he was awakened at about 4:30 a.m. by birds. “It was very quiet, and then the birds started,” he said. Teacher Torrie Hurd, who organized the project, said it went well. Hurd said the students will shoot for 23,000 books next year. 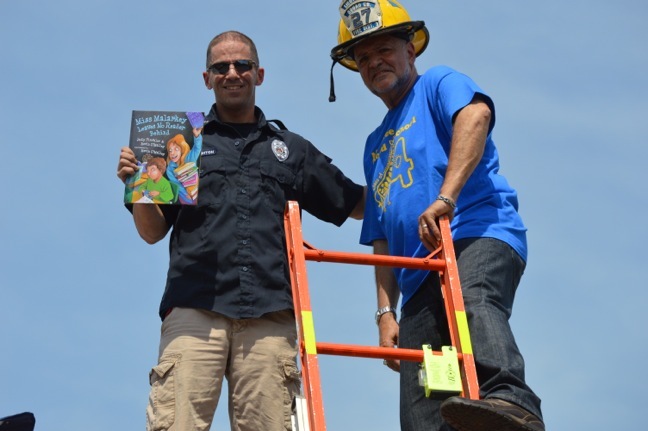 Lt. Ryan Daughton of the East Franklin Fire Department, the school district’s fire prevention coordinator, left, and MacAfee Road School principal Bill Grippo atop the school’s roof. MacAfee Road School principal Bill Grippo is going to great heights to keep a promise to his students. Well, as high as the school, anyway. Grippo on the afternoon of June 17 ascended a ladder provided by the East Franklin Fire Department to the top of the school, where he planned to spend the night. The reason for Grippo’s sleeping al fresco is a challenge he issued to his Pre-Kindergarten to 4th Graders: Read at least 20,000 books by the end of the 2013-2014 school year, and I’ll sleep on the roof. “I never thought they’d do it,” Grippo said. But they did; in fact, they read close to 23,000 books, all verified by their parents, he said. So, accompanied by the chants of his students and staff, Grippo found himself that afternoon climbing the ladder to his temporary bedroom, complete with chair, futon and radio. “The reason why I did it is because without literacy, there is no freedom,” Grippo said. “We’re teaching kids to really be free, but they have to be able to read, to comprehend, to write, to spell. “A lot of kids in our country are going to high school unprepared, they’re going to college and having to take remedial classes,” he said. The challenge is part of the school’s “Growing a Garden of Readers” program, begun five years ago by MacAfee teacher Torrie Hurd. The program was created to increase parent involvement and student achievement in the school, according to a press release about the event. Progress in the program is measured weekly, and parents sign response journals to verify their children read the books and wrote a report about them, according to the release. Students receive prizes such as pencils and bookmarks during the program, and students who have read the required number of books monthly are entered into raffles for other prizes. 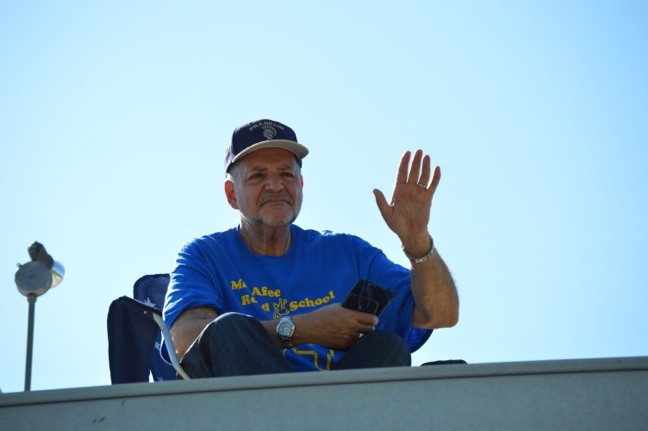 The idea of a principal sleeping on the roof of his school originated in “Miss Malarkey Leaves No Reader Behind,” a book from which Grippo read after he’d climbed up on the roof. In the book, Principal Wiggins promises to dye his hair purple and sleep on the roof if the students read 1,000 books that year. Grippo planned to greet his students the morning of June 18th as they entered the school.